There are various advantages of visiting Ashtead, a village in Surrey’s Metropolitan Green Belt. It is – unsurprisingly – resplendent in greenery, while shops, restaurants and cafes add to the enticing offer. When seeking to travel in Ashtead, you should consider utilising our travel hire services. We can deliver this private hire Ashtead cab service through a mixed fleet of minicabs. Which of these vehicles you should choose will depend on your requirements and preferences. While many typical passengers will like our saloon car, corporate travellers could prefer the executive car. For groups with a lot of luggage to take along, there is also a 7-seat MPV and 8-seat minibus. However, when turning to our company, you would consider not only the cab to book, but also the place to visit. The village’s attractions include a two-part conservation area with the Ashtead House mansion – while, north of the local railway line, there is the nature reserve Ashtead Common. Wherever you want to go in Ashtead, you might want the vehicle to pick you up at an airport or hotel. Alternatively, you might want that pickup spot to be a particular London Underground or Overground station... or, indeed, simply your home. We can cater for any of these preferences, whether the spot will be in Ashtead or another nearby area also served by our drivers. CRB checking has been undertaken for these drivers, who will greet and treat you warmly and professionally. Our Ashtead minicab drivers can then transport the safe and secure you to the destination that you have specified. This could be, if you intend to embark on a holiday abroad, a major London airport or, if you have a medical appointment, a hospital or GP's practice. As you can see, the choices are vast when you book one of our Ashtead cabs. Retail trips, sightseeing and late night deliveries are also possible with our services, which do not come with hidden charges. Priority service is also there to draw upon once you have set up a special Viceroy Cars Limited account. 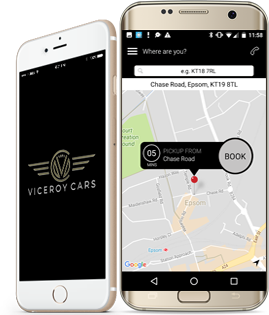 Book on the web by clicking this link, through email by using info@viceroycars.com, or by phone - call 01372 722222, a number which also allows access to 24/7 customer support. I loved my trip to Ashtead and will definitely be recommending it to friends. I’ll also be recommending Viceroy Cars as our driver gave us loads of useful tips of things to do in the area. When my normal train wasn’t running, Viceroy Cars were so helpful and there was even a driver in the area who picked me up within five minutes and drove me home to Ashtead. Booking through the app is so fast and the tracking facility is really useful. It’s been invaluable for getting our staff home as quickly as possible when they are working late.